I get it, building a website for the first time can be a little intimidating. Yeah, you know how to use one as a visitor, but building one? It's a whole other ball game. When building a website there's a whole host of new terms you'll need to understand before you can get to the actual building. Here's the important terms you'll want to understand, with a clear explanation even your great Aunt Helga can understand. Website Building Platform: Back in the day people would literally write lines of code to build a website, and that was quite honestly, a nightmare. Now, there's businesses that make the website building process easier than literally writing out lines of code. These businesses are called website building platforms. So basically, the name of the system or business that you choose to build your website with. There's tons of them out there. The major ones are WordPress, Squarespace, Wix, and ShowIt. Domain: A domain is the 'www.yourwebsitename.com'. It's the name and link of your website. My domain is thepaigestudio.com, you'll see it up there in the address bar of your browser. You'll need to buy your domain from a domain name provider. Email marketing system/service: When people get into building a website, they tend to also get into starting an email list. Instead of writing down all the emails you gather on a piece of paper or in a Word Doc., it's best to choose an email marketing system or service for that. This is different than your @gmail.com, or @yahoo.com. An email marketing system/service helps you send emails to hundreds or thousands of people at once, helps you organize your subscribers by interest, and helps you set up automatic emails (eg. once a person subscribes, automatically send them an email with an opt-in gift, or welcome email). Opt-in gift: This is the 'free gift' that's sent to new email subscribers to entice them to join your email list. 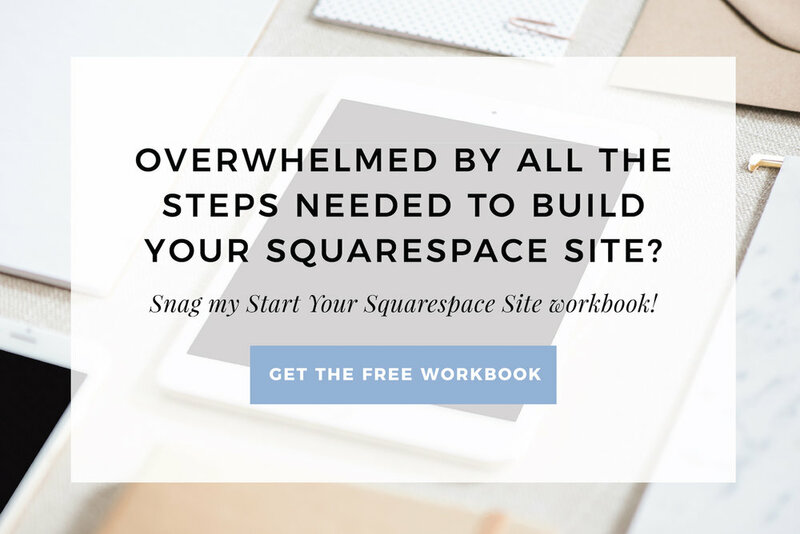 Ever gone on to a website and they advertise a free workbook, email mini course, tops 10 tips PDF, etc.? Those are all opt-in gifts. Opt-in gifts normally come in the form of a PDF, though they also can be videos, classes, printable worksheets, and more! Popup: That thing that generally annoys visitors, but is actually fabulous for growing your email list. A popup is a small new page that overplays on top of the current page a visitor is on, normally displaying some sort of ad, discount, or opt-in gift. E-Commerce: Think of it like another word for 'online store'. An e-commerce website is a website that sells stuff online. Favicon: Are the teeny tiny icons that appear in your browser tab, which helps you visually recognize which tab is with which site, without needing to read. They're generally a more simplified version of the company's logo. Banner: The area at the top of a page with a large photo that spans full width, from side to side of the page. Parallax: A design option that makes it look like a page is 'melting' into itself by moving sections of a page at different speeds. Backend: The backend is only available to be seen by the editor of a website. It's the place where you make changes and update content on your site. The backend is not visible to website visitors. Backlink: A link that goes from another site, back to your site. These are gold for helping your SEO! SEO: Stands for Search Engine Optimization. That's the process of making your site appeal more to search engines (like Google), and therefore 'rank' (show) up higher in someones search results. Bounce rate: The percentage of people who visit one page on your site and then leave before clicking any other links or sticking around to visit other pages on your site. Mobile: If your site is 'mobile-friendly' or 'mobile-responsive' or sometimes people will just say 'works on mobile' that means your site works well on a smartphone or tablet, as well as a desktop or laptop computer. Cache: Your browser will 'cache' (think save) files or details of a site, so the next time you visit the same site, it loads faster. Granted, if you make changes to your website and your browser is still showing you the old 'cached' version, it might be necessary to clear your browsers cache to see the new version of the site. CSS: A type of coding that adjusts the style and look of your site. HTML: The type of coding that makes up the majority of a website. HEX color code: A string of numbers and letters that define a very specific color & shade. If you copy your HEX color code, you can then use those exact same color in other places on your site, for other design items, in your branding, etc. Facebook pixel: Some code that you can install on your website to note when visitors go to your site or a specific site page, which you can then use that information to show those same past website visitors specific ads on Facebook. HTTP: This is the thing that comes before your domain. eg. http://www.thepaigestudio.com. HTTPS: This is the secure version of your site and domain. eg. https://www.thepaigestudio.com. Secure is good, Google likes secure. Metadata: Info on your website/page that isn't viewable to site visitors normally, but is used to tell Google and other applications what your page/page content is about. Eg. When someone pins a photo from your site, the 'metadata' of that page becomes the Pinterest pin title and description. Sitemap: Think of it like a map of your site. A sitemap tells search engines all of the pages that are on your site, and how they all link to each other, and other sites. Having search engines index your sitemap is important for showing up in Google search results. Index: When a search engine 'crawls' your site to find all of the pages in it. Crawl: Basically search engines taking a peek through your site and collecting info and all the details of your site. Google: God of the internet. Don't do anything on your website that Google won't like, cause it won't go well for you. Remember Google = internet God. There you have it, pretty much all the terms you need to be familiar with when you go to build a website! Now, to help you get on the way to actually, you know, building your site, here's a few posts that'll help!